Bet Online Poker is one of our top choices for players from the United States. This is a fairly new site to the US market, but they hit the poker world by storm. They have created state of the art software. This site is also offering a large variety of freerolls, ongoing bonuses, and much more. We are very impressed with the whole package at Bet Online. The poker room is one of three sites operating under the BetOnline umbrella. Players will also have instant access to the online sportsbook (currently one of the largest in the US) as well as the casino. The casino features a live dealer casino, whereby players can play craps, roulette, baccarat and blackjack with a live dealer streamed through a webcam. Overall, if you are looking for a solid poker room that accepts US players, BetOnline is our #1 choice! Please Note - BetOnline Poker accepts players from ALL US states! BetOnline is the only US poker site giving new players their bonuses up front. Get 25% cash on all deposits for life! BetOnline has simplified the bonus and promotion process. You don’t have to jump through hoops to cash in on extra money at this site. Instead of running long drawn out promotions that are hard to understand, BetOnline Poker simply awards you with a 25% Bonus on every deposit. Join BetOnline Poker here and receive your 25% cash bonus! Your 25% bonus will be instantly credited to your account once you have made your first deposit. The bonus will be in the form of tournament bucks which you will be able to use to enter any tournament offered at the site. If you win money in these tournaments then the money is yours to keep. Another great way to cash in on some free money at BetOnline Poker is by taking advantage of the multiple freerolls offered daily. In fact, BetOnline Poker runs a new freeroll every hour. These freerolls have prize pools ranging from $10 to $200. Participating in these freerolls is a great way to build your bankroll without risking any of your own money. 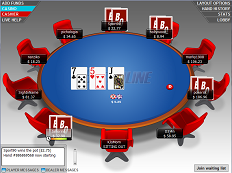 BetOnline offers Hold ‘em and Omaha games in all popular variations of these games. Cash games, sit n go tournaments, and multi table tournaments are all available around the clock. The majority of the active games at this time are mid to low level limit real money games, but this site is growing at a rapid rate and we expect this to change soon. The cash games stakes range from micro games which have a $2 buy-in to high stakes games with a $100 big blind. As we mentioned earlier very few high stakes games are populated at this time, but you will be able to play high stakes games during peak hours. Tournaments run around the clock. The site is a young site so they are still building their player base. The tournaments don’t have thousands of players, but they do have enough players to make it fun to play. The majority of the players are new and inexperienced players so you have a great opportunity to win money when you play at BetOnline Poker. This is still a fairly new site, but they have developed a nice player base in a very short period of time. Over 1,000 players will be found playing at this site at any given time. The traffic increases during peak hours. Players will have no problems finding a juicy cash game at any time of the day or night. BetOnline has a variety of US friendly deposit and withdrawal methods. Players can fund their accounts by using Visa, Prepaid Visa, Mastercard, Neteller, Moneybookers, eCheck, Bank Wire, Person to Person Transfer, and Paper Checks. This site accepts poker deposits as small as $50. BetOnline processes payouts as quickly as possible. It is difficult for all US facing rooms to process cash outs, but you can rest assured that you will get your money. It just takes a longer now than it did prior to Black Friday.